View our newest publications and featured items. We also now have new CD editions of many printed books! 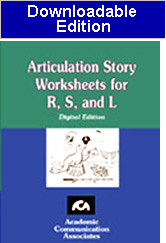 Use the CD to print out worksheets! Many of our books can also be downloaded. Ages 4 through 11. 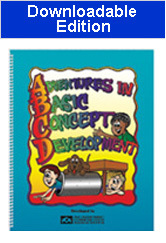 Help children develop basic concepts such as through, around, wide, narrow, top, and bottom. 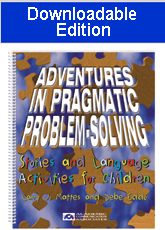 Ages 5 through 10.The problem solving activities help students to verbalize solutions for problems, identify causes, identify consequences of behavior, and recognize the viewpoints of others. 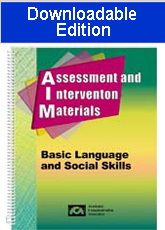 Here is a collection of practical materials that can be used in programs for students with autism, developmental disabilities, or augmentative communication needs. 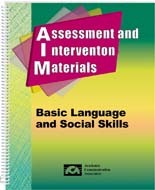 The downloadable edition includes the complete book PLUS the special supplement - Save MONEY by downloading this product. Ages 3 and up. 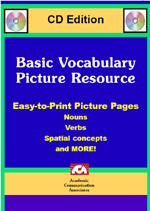 This product is a collection of hundreds of reproducible pictures for use in your language development program. Print out the picture pages that you need as often as necessary from the CD! Board Games for Verbal Reasoning- Expanded edition with NEW CD. Ages 4 through 9. 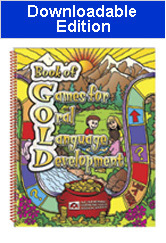 Develop basic verbal reasoning skills using the colorful game boards in this kit. 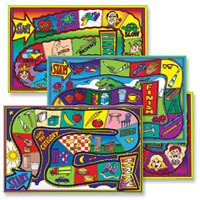 Each board can be used for one or more verbal reasoning activities. Ages 5 through 10.- Downloadable Product. Games and thinking activities that can be used to strengthen language comprehension and production. 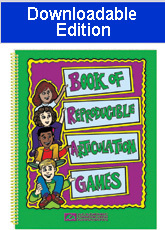 Downloadable edition of book. 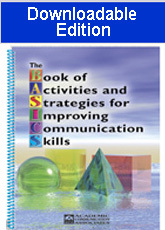 Teach children the "basics" of effective communication using the activities and strategies in this book. 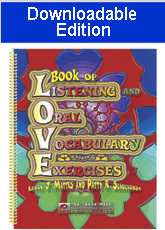 The activities build vocabulary and oral expression skills! Ages 5 through 8. 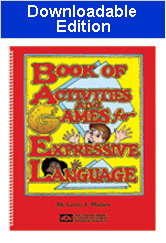 Stimulate the development of receptive and expressive language skills as children play high interest language games. Ages 11 through 17. Here is a collection of high-interest activities that can be used to develop auditory processing, vocabulary comprehension, and oral communication skills.